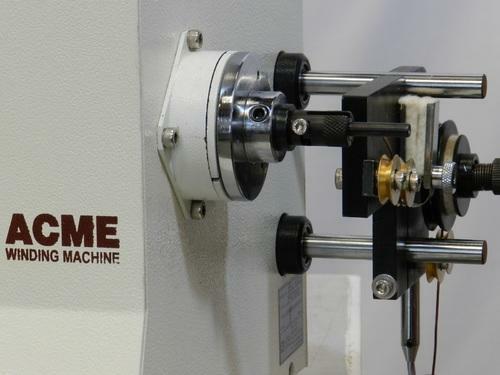 Acme Electronics manufactures various winding machines for bobbin and toroidal coils. Alongwith these machines also Acme supplies winding machines for MCB coil winding machines for various spring type coils used for sensing currents or used as a inductors. These wound coils dont contain any core during winding or bobbin during winding. Please contact or forward us your winding machine requirement alongwith wire size and no. of layers. Established in the year 1999, in Vadodara (Gujarat, India), we “ACME Electronics” are the leading manufacturer, exporter and supplier of a qualitative gamut of Winding Machine & Equipment. Our products are manufactured from high grade quality material. Our products are duly tested by our experts on various quality parameter before final delivery. We always ensure the client satisfaction while delivering our products to client end. The products are manufactured using the finest raw materials and modern machinery, in compliance with the set industrial norms and guidelines. Because of this, the offered range has a longer functional life and provides superior functionality. In addition the offered products are marked at the best rate possible. Our offered products are highly appreciated among our client for their unmatched quality and unbeatable prices. We are exporting our products globally.